I honestly didn't want to garden. I told my family I would watch with a lemonade in my hand while sitting in a lawn chair as they worked the garden. But I actually enjoyed the planting and working with the flowers and vegis. Now my kitchen table is full of tomatoes in various stages, waiting for them to ripen so we can can them. So I will be canning only a few at at time over the next couple of weeks. I'll keep you posted. Of course I will have to show you a picture of all my filled mason jars when I'm done. 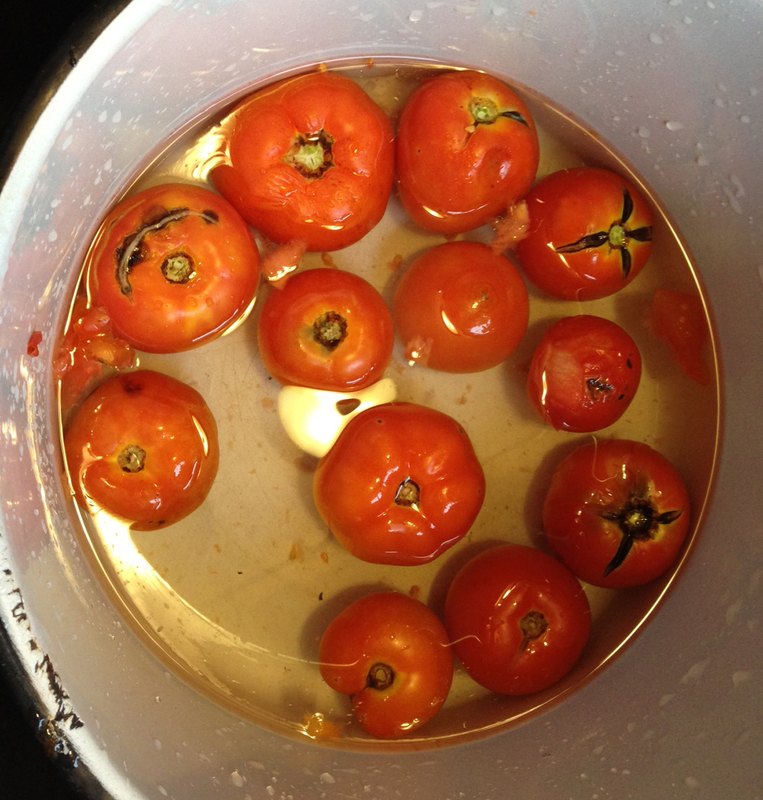 We had a dozen or so tomatoes that were ready, so my mom showed me how to "water bath" can them. My friend, Lisa, gave me a bunch of mason jars so we could can and wrote out a really nice essay on the process. Armed with that and my mom, I felt confident enough to attempt water bath canning. It really amuses me to think of me gardening and canning. Honestly, I'm the sit with my laptop for 8 hours at a time kinda gal...only domestic enough to get along. So I guess you could say I'm broadening my horizons. I thought it was going to be hard or grewling. But it wasn't. Here's the process - give it a try. I dare you! 1. 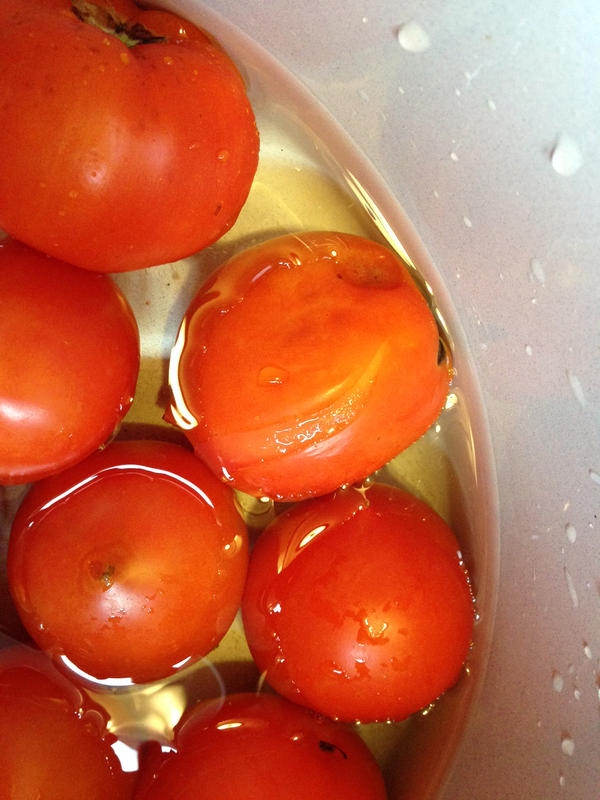 Put the tomatoes in an enamel pan and pour boiling water over them so they are covered. 2. Let them sit for a few minutes and then dump out the hot water and pour cold water over them. 3. 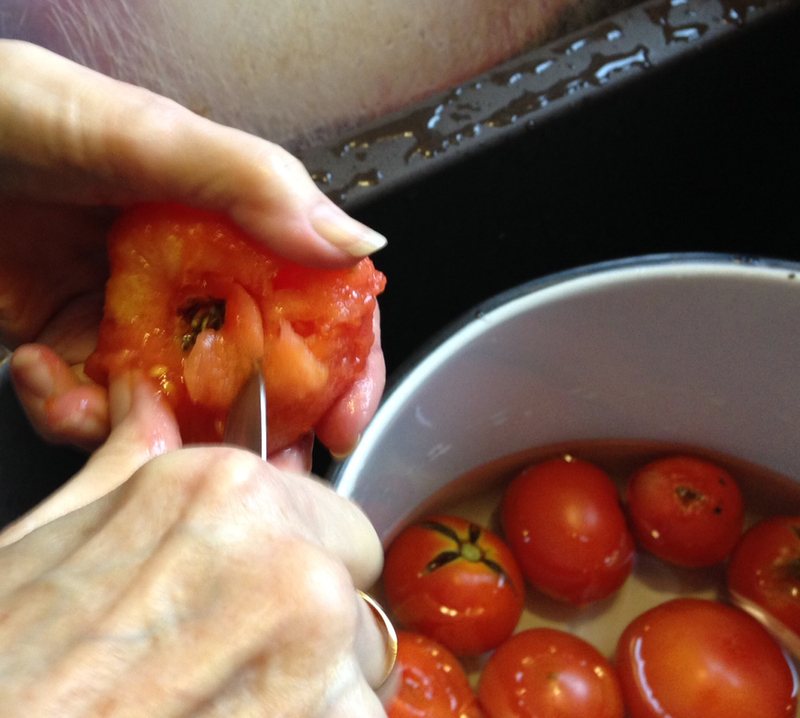 You should see the skin start to come off or at least pucker a bit, so just pick up the tomatoes and cut out the core and peel off the skin Cut off any bad spots. 4. Keep them in the enamel pan and cook them 10 - 15 minutes or so. 5. In the mean time pour boiling water over the mason jars to sterilize them (I just use my dishwasher, it's easier) and heat the lids on the stove in simmering water to soften the rubber. Keep the lids in the hot water until you need them for on top of the mason jars after they're filled. 7. Add 1/4 tsp. 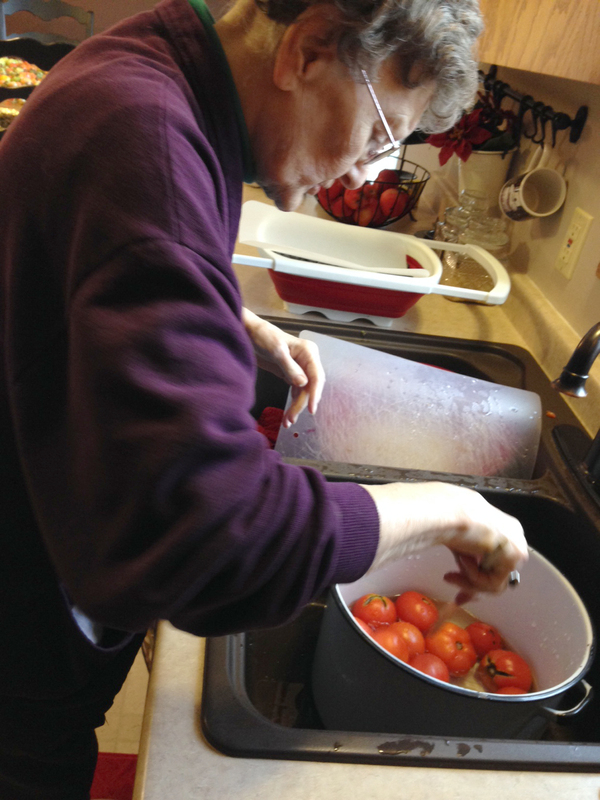 of canning salt in the tomatoes. 8. 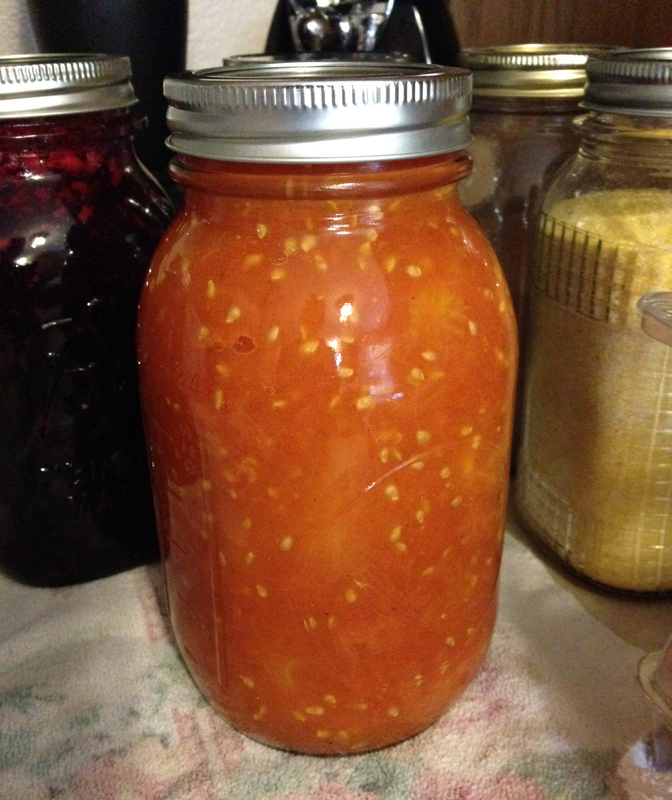 Wipe off the top of the jars with a wet washcloth and place the warmed lids on top. 9. Screw on the rings and tighten just enough to keep in place but not tight (it's called "finger tight"). 10. 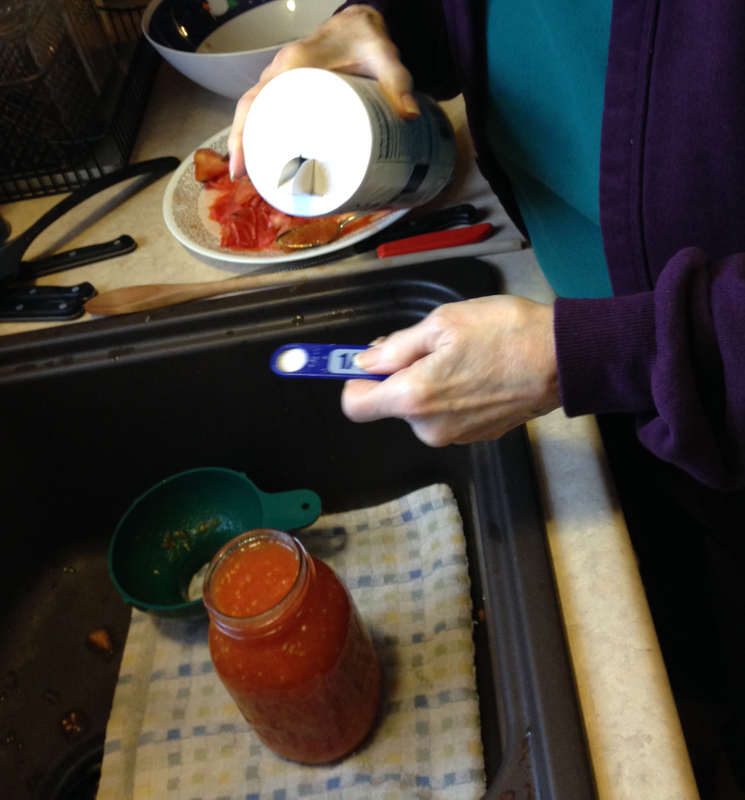 Lisa adds this step: Immediately put jars into a canner full of hot water. When the canner is full of jars, turn up the heat and cover the canner. The water should cover the lids of the jars, but not run over when it boils. If you’re a little short, add hot water to the canner - cool water can overstress jars and break them. Sometimes I top off the canner with the hot water the lids were in. 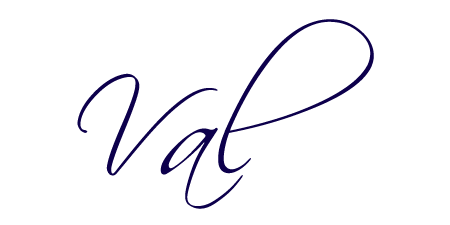 When the water boils, start the timer. 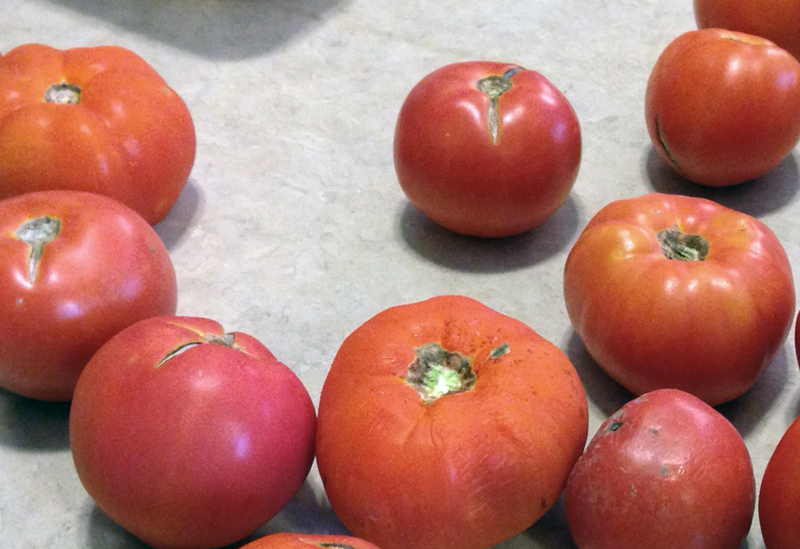 Quarts of tomatoes need to be boiled for 40-45 minutes, and pints for 35-40 minutes. Have a folded old bath towel handy nearby. 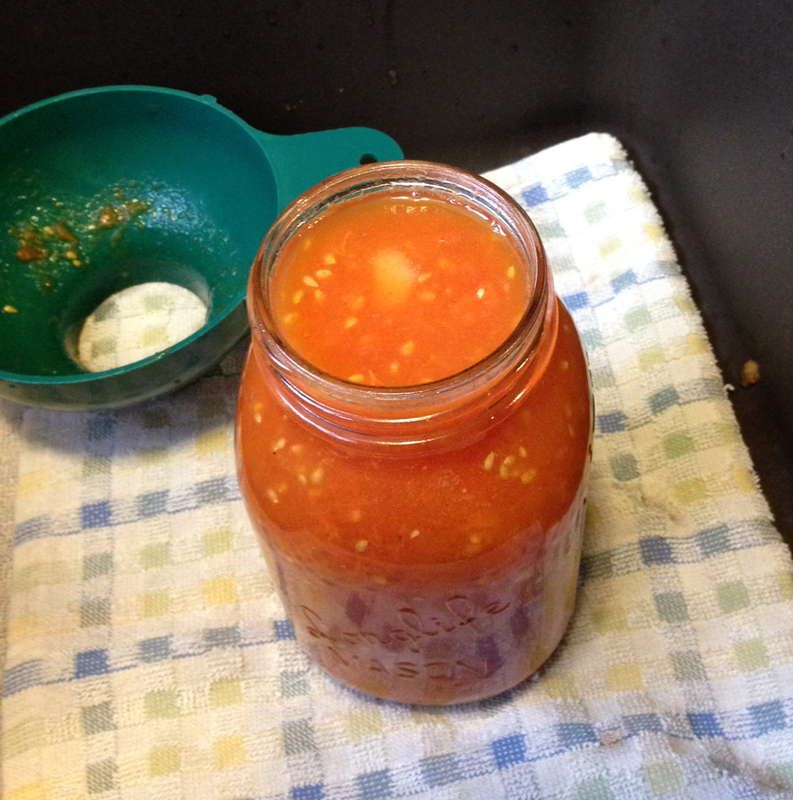 When the time is up, remove the jars from the canner and place them on the towel, away from drafts, to cool. Don't tip the jars as you lift them. The lids will pop as the vacuum forms while the jars cool. After 24 hours, you can remove the rings to reuse them on other jars. As you do, check the seals - the lids should be curved inward and tightly sealed. Any jar that doesn’t seal can be put into the frig for use in the next couple of days; or the contents can be frozen for several months until needed. Don’t forget to label the lids with the date and contents. 11. Stand back and admire your work! Not too bad for a newbie, ay? The next day we canned grape jam! Tell me about your canning adventures. Who taught you how to can? Are you still canning today? I was very fortunate I had my mom around to get me started. 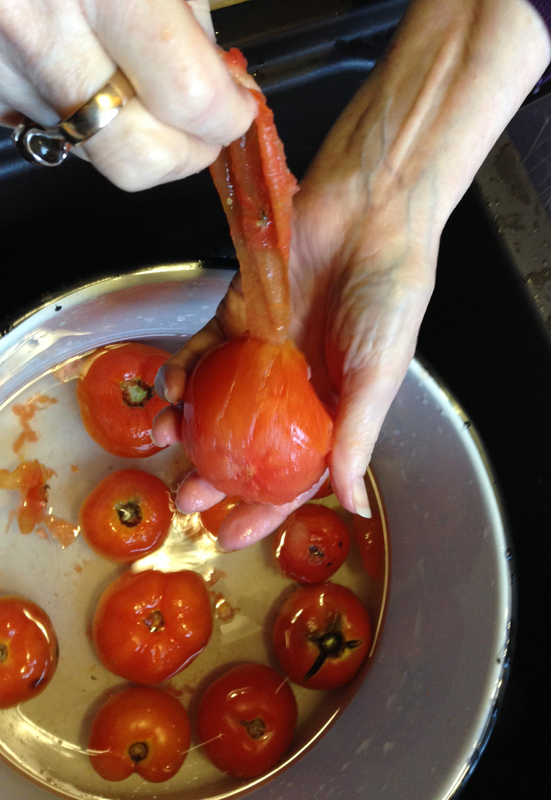 My mom used to can tomatoes. And it is a skill I am going to have to learn (hopefully next year) when I expand my garden (because given the price of water, I better be growing something to eat). @ Mary-Margaret, Next year we have big plans. We want to enlarge our garden and put in more things that we can freeze and can. I froze a ton of apples/applesauce/pie filling, but would really like to can them instead. They are taking ups so much room in our freezer. 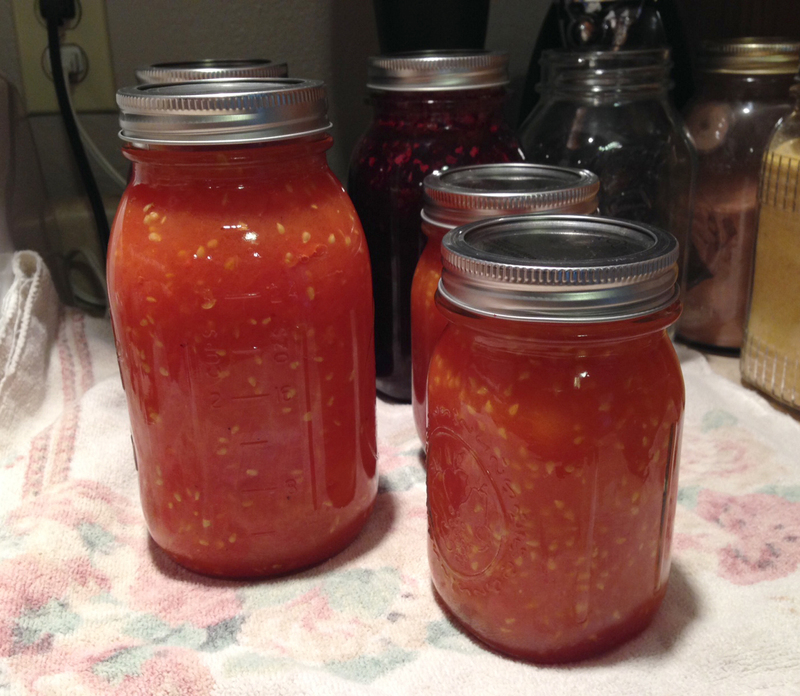 I would like a good recipe for canned salsa – wanna share?